The mower caught on fire and was totally destroyed shortly after I finished cutting the lawn. My neighbors came running when they saw the smoke. The gas tank exploded about ten minutes after I got off the machine. Luckily, no one was hurt, but this could have been a life threatening event. TORO claims there was nothing wrong with this machine and refuses to stand behind their product. All I ever did was cut grass and mulch leaves. I did not modify anything on this machine and was only used as designed. I have repeatedly tried for the past four months to get Toro to understand that there is a design problem in this machine, but they refuse to listen. They claim there is nothing wrong with this mower. I am a retired mechanical engineer who worked with machines of all kinds for more than 30 years, and have dealt with machine failures for all of those years. If this event had taken place at some company, OSHA would be investigating this because of the potentially life threatening consequence. Since OSHA doesn't apply to consumers, I have filed a complaint to The Wisconsin Department of Agriculture and Consumer Protection. This isn't just about the replacement cost; I never expected Toro to replace it since I used it for two summers. I did expect they would want to find out why it failed and pay maybe half of the replacement cost. Toro refuses to engage in any part of these expectations. These statements are true. I have records of correspondence with Toro and four witnesses to this event. Yet another belt snap. They stretch loose and catch. I am now trying a John Deere belt same length. Never again a Toro. We have had our Toro LX425 for 8 years with no problems at all. It is a great mower and I would buy another one. I buy all my equipment used. Can't imagine shelling out 1600 for this. Orig owner practically gave it to me because he wanted nothing to do with fixing it. It was never assembled properly or taken care of. Only 50 hrs on it. 8 things had to be addressed, but I easily did it myself. I also have a 1987 Wheel Horse 416-8, 42" deck and 2200 hrs on it. Its going strong because personally maintained. Idling, it will drag 400 pound rocks around all day, so this newer "Toro" is completely different. The LX425 is a light duty mower with the 20 HP Kohler and preferred CVT non hydro transmission. I restored it like new and my neighbor is jealous as heck. Haven't had a problem yet since I addressed those issues. It runs smooth for a 1 cylinder , mows even, fast, & blows all the leaves. Doesn't smoke, leak, throw belts, or catch on fire (yet). Maybe you should take a class on how to maintain a machine that is thrown together, and in the real world is categorized as severe duty. By the time the average person decides to take it to the shop for repairs or required maintenance it's too late. I've had this mower for 3-4 years now. Constant problems. Uses a lot of gasoline. Has always had a large bang noise immediately after powering off. Have tried several things to stop it. Uneven cut. Several batteries. And I have it checked for maintenance every year. Piece of junk. Won't buy another Toro. engine smoke when hit a bump in yard? the last 'toro' wheel horse I owned got 20 yrs of service and was still running when sold? bought a new toro 425 hoping for same results? 1st time is brake and hydro pedal on same side? not good. also I noticed when mowing occasionally blue oil smoke comes out exhaust? sometimes on a slight hill or when a bump in yard? Returned to dealer and found no problems, and yes I checked oil so its not overfull! Even neighbor noticed this? I'm completely dumb founded on this problem ?? any suggestions? Many of the same experiences here as well. Have had drive belt replaced 3 different times and have to pay the fee to get it to the shop and back each time as well. Replaced battery after only 2 years even though I brought it in over the winter. Smokes like the devil not only on start up, but when turning; going up a hill; anything but going straight. No more Toro's for me either. Our Toro Timecutter Z5000 caught on fire. The engine quit while I was cutting grass. when I turned the key to restart the engine it burst into flames. Was able to put it out with buckets of water, whole engine melted or burned. Bought in 2000, had been excellent until it burned. Toro says call your insurance company! Expected much more from Toro, have used other riding mowers, John Deere, Yazoo, even Yard Machine, much longer than 5 years, Deere ran for almost 20 years. All were well maintained and repaired as needed. I think our first Toro will be our last. I own one of these or at least I did. Mine caught on fire yesterday also. I was lucky I got off!!! Smokes and backfired every time we used it. 3 years old. Toro assured me it was fine. Started on fire today. Almost burned my house down. No help from Toro - only two year warranty. If you own one, keep a fire extinguisher handy! another piece of junk from P.R. i bought the LX425 mower used, so far the only thing I've notice that it smokes when you first turn it over. The deck has to be leveled. I also bought a Toro LX425, assuming it was a qulaity machine because of its name. Boy, was I wrong! I had to have the engine worked on the first year I had it. Every time I start it, it takes a few minutes for the oil to burn off the manifold. The belt keeps coming off, sometimes two or three times per mow. I've also had battery problems. It just doesn't keep the battery charged like every other riding mower did. I'll never buy another Toro! Hi from Argentina, SouthAmerica. I purchased a new LX425 Lawn Tractor in 2008 in a well reputed local hardware. At the moment I changed 7 broken belts, aproximatelly 2 per summer (here the climate is as California, I crop the grass only in summer time). I had also problems with the battery and I replaced it. Finally the vendor recommended me to send the tractor to the Toro official service in Buenos Aires (800 miles away). I send it, the service delayed 1 month (1 month without croping grass in summer!). They changed some pieces (pulleys, rods, sharpened blades, etc.). I paid almost US$1000 for the freight and service (tractor price in Argentina is US$3200). At the moment I paid twice the price in reparations... When the tractor turns back, it worked fine during about 2 hours, then the belt broked again! I consulted other local service (Husqvarna, no more expensive trips to Bs As...), they replace the belt (original one, imported) and said me that the problem is a design defect related to the angle of the belt when I change the croping level, and recommended me do not change the level (uf! !, ok...). Then I used the tractor at the adjusted level, and the belt worked more time, but finally broken again after about 3 hours. Now I read now some complaints in My3cents.com and in justanswers.com. I will remove the grass croping plate and I will use just the tractor for ride in my farm... an expensive toy. I will buy a John Deere in the official dealer. Price here is about US$6000. Series number of my LX425 "toy" is: Model# 138X60R6744. Serial #1E297H1084. Dom# 5/2007. Sorry to hear all the complaints about this lawn tractor. 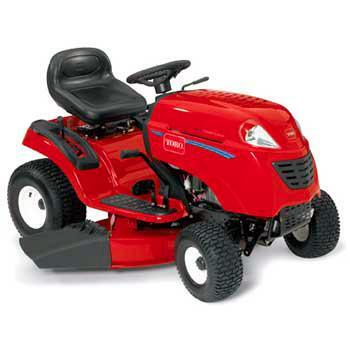 We bought the TORO LX425 about four years ago. We used it for two seasons and it never gave us ANY problems. Last season we didn't use it. The battery had died, it was a dry season, so we had a friend mow our lawn a couple times to help him out financially. This year, we bought a new battery, got a tune up and it runs like a gem. LOVE this little tractor! Nice tractor but the belt comes off everytime I stop the mower if I run it always it is ok untill it got wet Dew on the grass the belt just rubbed till its nolonger a belt just a round rubber belt.. well I got my son-in-law to look at it, he has his business small engine repair so I hope he figures it out. I bought this tractor in Spring 2007 from Home Depot, and I have had problems too. The Deck belt keeps coming off and Toro doesn't supply an original replacement for it and the Generic replacements are a hair too long so now it comes off at least two times per mowing. Luckily, I am handy enough to know how to put it on again. Engine smokes every time I start using it. And the battery, while it was working when I bought it, went dead after the first year. Will not buy another Toro Tractor again. Sure would like to know what else to get next time that is affordable. only problem I am having is a blade belt keeps coming off!! very trembing. Need help! Only 3rd summer using LX425 and have had to put to much money and time in for repairs.Will never buy another Toro product of any kind.I bought this brand new and never expected to be junk because of there name. I've owned this tractor now for about 3 years and will never buy another Toro. I've had nothing but problems and have spent a ton of money always fixing it. I've never abused it and take care of it all the time. For this kind of money it should not be. We purchased this toro? from Home Depot March 2007 and the first cut the belts came off, We had it in the shop and they replaced all the belts and did other things (regular up keep) came home and started mowing and off came the belt. We have no other problems, just keeping the belts on. I am also a disgusted owner of a Toro LX425 Lawn Tractor. I purchased it because it was the cheapest one on display, but it has not even been worth the "CHEAP" price. I knew it was a lemon from the first use because there has been one issue or another almost every time I cut grass. The battery was dead when I bought it. Now the steering shaft seems that it is about to break. My mower has not caught fire, but is smokes like it is going to...and the oil is at its proper level. After two summers of cutting, I guess it has reached its useful life. Next time, I will pay the extra money for a mower that is worth my time and money. I also own a piece of junk Toro LX425. Purchased three years ago and will never buy one again. I was told by a Toro dealer that I had gotten my good out of it with less than 200 hours on it. It has never burnt but sometimes I wish it would. At least I would be rid of it. As you said, Toro, has never stood behind it. Maybe they are afraid they will be hit by flying parts.